Illustrations from Alice’s Aventures in Wonderland, or, Alice in Wonderland, by Lewis Caroll (1866). 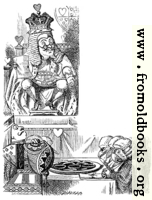 The illustrations were done by Sir John Tenniel [1820 – 1914]. These images were scanned by Shawn Calvert from the 1898 edition (MacMillan & Co., London), who kindly contributed them. Liam Quin made the JPEG versions. There are many copies of the Project Gutenberg scans of these illustrations on the web. These images are not derived from those; they were made by a professional graphic designer, at much higher resolution, and have much more detail. Lewis Caroll was of course a penname (nom de plume) of the Reverend Charles Lutwidge Dodgson. The book was written after he and a friend, Rev. Robinson Duckworth, went on a trip in a rowing-boat at Oxford, on the River Thames, from Follie Bridge to Godstowe, near Oxford, together with three schoolgirls. 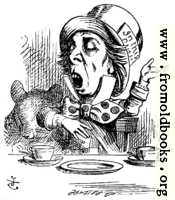 The North American Lewis Carrol Society has collected pointers to online Alice resources. Some of the engravings are signed Dalziel, and there are also some images and extracts from a book by and about the Dalziel Brothers. Published by: McMillan & Co.